Blue and white checked short sleeved, open necked blouse. Students in Year 11 wear a plain pink short sleeved, open necked blouse. The Student Senior Leadership Team wear a white, short-sleeved, open necked blouse. School shoes should be plain, black without bows. Trainers, Converse and boots are not allowed. Students are permitted to wear one set of plain, small studs in the earlobes only – no other piercings are allowed. Hair colour and style should be appropriate for school. Bows and decorations are not allowed, headbands and bobbles must be plain, preferably navy blue or black. The only item of jewellery allowed is a watch. Nail varnish or any nail enhancements are not allowed and students will be asked to remove them. Makeup should be kept to a minimum. 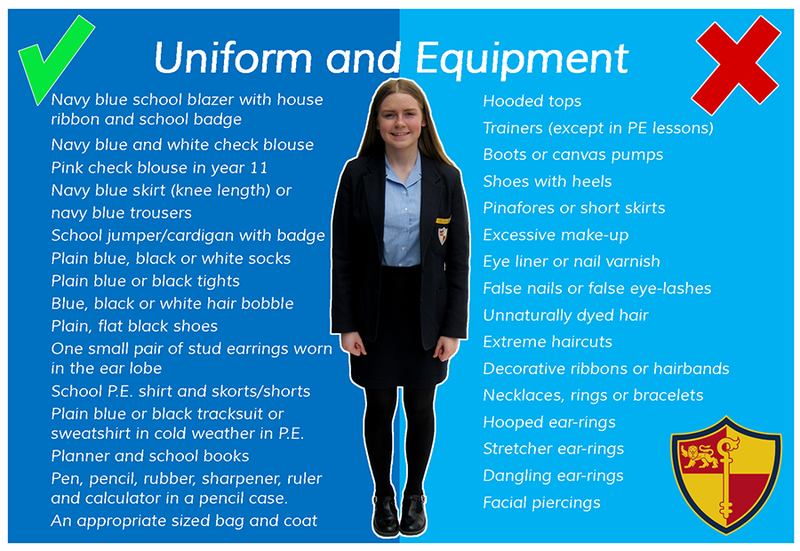 Students may not be allowed to attend lessons if they have an incorrect or unsuitable uniform. Trainers – Please ensure that your daughter has correct trainers for PE. She will not be allowed to wear pumps for PE lessons. Uniform will be sold over a series of evenings during the summer term for all students joining us in September. You can order and pay and we then operate a click and collect service. You may call in to collect ordered items, or your daughter can collect from the office. uniform on or return an item. You can also pay with cash at this time. Click and collect: You can place an order and pay online and your items will then be prepared and ready for your daughter to collect from our school office. This is so convenient and easy to use. It saves you the trip to the current shop and there are no delivery charges or fees for this service. If an item is unsuitable then you or your daughter can simply return it and we will arrange for an exchange. Items in store: You can also purchase directly from the school shop where you can pay with card or cash and where you are able to check sizes. The shop will be open every Wednesday from 3.30-4.30pm. During the summer months, we will have additional dates for you to purchase directly from the school shop. Dates will follow during the summer term. The school shop is operated by Wirral Uniform Centre as the ONLY appointed stockist of the Prenton High School uniform. From Monday 26 February you will no longer be able to buy items from the Birkenhead based shop. All purchases are to be made as above.